September in Australia means that wattle trees are in bloom, fragrant and full of colour. The blossom can be any shade of yellow from pale cream to deep gold, depending on the species. The colours of the wattle are the inspiration for the green and gold, Australia’s national colours, officially proclaimed in 1984 (but used as sporting colours for much longer). Wattle blossom has long been emblematic of Australia; branches of wattle appeared on the Australian Coat of Arms in 1912, and in 1988 the profusely flowering golden wattle (Acacia pycnantha) was named as the national floral emblem. 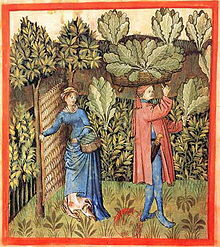 A wattled garden gate from a 15th century book, 'Tacuinum Sanitatis'. 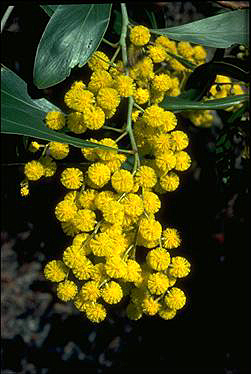 The following year saw Wattle Day celebrated in Sydney, Adelaide, and Melbourne. It became especially popular during the war years, 1914–18, when it began to be associated with fundraising for charity. Since the early part of the twentieth century Wattle Day has waxed and waned; not all States observed it and the date varied locally. 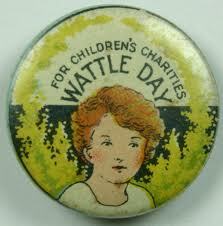 National Wattle Day (1 September) was formally gazetted in 1992. Happy Wattle Day to all Australians at home and OS. This entry was posted in colonial history, etymology, patriotism and tagged Australian Coat of Arms, floral emblem, golden wattle, Governor General, green and gold, Monty Python, Queen Elizabeth, wattle, wattle and daub, wattle blossom, Wattle Day, wattle dress, wattle tree, wattling by Julia Robinson. Bookmark the permalink. When I lived in Canberra around 1990, I realised that some wattles actually flower in winter – and they looked spectacular with their yellow in the clear, sunny days that Canberra sometimes served up. Not being a botanist, I’m not sure why 1 September was chosen for National Wattle Day. An article at http://www.abc.net.au/science/articles/2003/07/03/2578547.htm explains more about wattles and their flowering during winter (and at other times).